The Isagenix Natural Accelerator will help you melt away those unwanted kilograms. These are powerful capsules that contain cayenne, great tea and other vital ingredients to help your body burn fat without feeling shaky. The Isagenix Natural Accerator product does not contain any dangerous ephedra or caffeine. Each bottle of Isagenix Natural Accelerator comes with 60 capsules which is a 30-60 day supply. Isagenix Natural Accelerator is a vital component to all Isagenix nutritional cleansing programs. 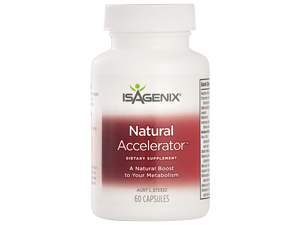 What are the Ingredients in Isagenix Natural Accelerator? For the full list of ingredients, download the PDF here. For more information about Accelerator or any of the Isagenix products in general, contact Nicole at info@isaelite.com.au or call her on 0413 254 398. How Can You Buy Isagenix Natural Accerator?